In his essay A Long Short War: The Postponed Liberation of Iraq (2003), the late Christopher Hitchens observed how al-Qaeda’s “means, its ends, and its ideology all consist of the application of fanatical violence and violent fanaticism, and of no other things”. It was, he brooded, “partly a corrupt multinational corporation, partly a crime family, partly a surrogate for the Saudi oligarchy and the Pakistani secret police, partly a sectarian religious cult, and partly a fascist organization”. Now that the Islamic State of Iraq and al-Sham (ISIS), an al-Qaeda offspring, has arrived in Mosul to “liberate” its people, we know that this can also be a guerrilla outfit capable of taking and holding ground—while striking fear into the Iraqi people eleven years on from the western intervention. Today it is not the stars and stripes which flutters in the light breeze in some northern Iraqi cities, nor even the national flag, but the infamous, gold-trimmed, black banner of ISIS rallying legions of the disaffected. Incredibly, it appears that ISIS fighters have requisitioned military hardware and are on the march towards Baghdad to “settle old scores”. Mosul’s governor and his security forces have fled the battlefield, with hardly a fired shot in anger, while one-third of the city’s population, some 1.5m people, have been forced from their homes, streaming towards the Kurdish north. In response, the prime minister, Nouri al-Maliki, has asked the Iraqi parliament to declare a state of emergency, as a first step to try to bring the insurgency under control. This security and humanitarian crisis sits uneasily alongside the political rhetoric that accompanied the withdrawal of western troops in 2011. Then it appeared that the government in Baghdad had made a successful transition towards providing effective security, a mandate enhanced by the electoral successes of Maliki’s Daawa (State of Law) party. In the April parliamentary elections Daawa won 95 seats (out of 328), gaining a significant edge over its principal Shia rivals, the Sadrists, who won 34, with the Islamic Supreme Council of Iraq securing 30. Before the capture of Mosul, all evidence was pointing towards Maliki winning a third consecutive term and consolidating his position. Now his actions will decide not only his own political survival but that of Iraq itself. For some time Maliki has been centralising power in a majoritarian system of government. Like other Arab rulers (monarchist and secularist), he has survived by demanding the utmost loyalty. Any attack on his leadership has been equated with an attack on the government and state of Iraq, with some critics shouted down as just as bad as Al-Qaeda and others detained. The lack of democratic trappings has led to the Economist Intelligence Unit labelling Iraq a “hybrid democracy”, with some Kurdish politicians going as far as to call it “a masked democracy”. A recent report from the International Crisis Group (ICG) affirmed that “ISIL’s rise is a symptom, not the main cause, of the poor governance that is the principal reason for Iraq’s instability”. Daash in Arabic) in Fallujah, which has remained under Islamist control for six months. The roots of ISIS’s seizure of the city go back to 2012, when Sunni protesters were cleared from the streets by Iraq’s armed forces. Indeed, the formation of the Sunni-based Military Council there was triggered by this civil unrest and the government’s heavy-handed response: the Military Council became hostile towards Baghdad and, remarkably, entered into what the ICG called a “Faustian Pact” with ISIS to keep Iraqi security forces out of the city. After adding Fallujah to its repertoire of “liberated areas” ISIS moved on to Ramadi, Mosul and Tikrit. The upsurge allows it to present the Iraqi government as unable to protect its citizens, whom ISIS can kill with impunity. By stepping up its guerrilla operations ISIS has yet again proved that the state is far from able to function independently of international assistance—whether that be from Tehran or Washington. The Mosul takeover also proves that the Iraq war still casts a long shadow. Ramadi, Fallujah and Mosul were key sites of armed resistance during the long years of occupation between 2003 and 2011—something not lost on the inhabitants. That echoes of the past are alive today is borne out by the ICG report, in which interviewees perceive no difference between the US military intervention and the Iraqi army’s efforts to quell ISIS in Fallujah and other Sunni areas. Some have even gone as far as to suggest that the Iraqi army “fights with US weapons” while adhering closely to Iranian strategy, doctrine and tactics. Twenty-five years after its formation in Afghanistan and nearly thirteen years after the attacks on the United States on 11 September 2001, al-Qaeda is stronger than ever. It is also operating with relative ease in more countries, primarily through the lead taken by its four key branches: al-Qaeda in the Islamic Maghreb (AQIM), operating across north Africa; al-Qaeda in the Arabian Peninsula (AQAP), based in Yemen; the al-Nusrah Front in Syria, and al-Shabaab, operating from Somalia. Some have adopted flags of convenience—in Yemen Ansar al-Sharia (Protector of Sharia Law). Others have sprung up in Egypt, Tunisia and Libya. Rather than having been beaten into submission in the “war on terror”, al-Qaeda’s ideological message is malleable enough to give it global reach—it has even recruited followers from the western countries it wishes to attack. Yet al-Qaeda is not actually behind the violence in Iraq. ISIS was disavowed by al-Qaeda’s “general command” earlier this year, principally because its leader, Abu Bakr al-Baghdadi, repeatedly disobeyed orders to work in co-operation with Islamist groups in Syria. As a result, ISIS is fighting an internecine war with al-Qaeda’s branch there, the al-Nusrah Front. Although he had sworn a bayat (oath of fealty) to Ayman al-Zawahiri and was bound by his loyalty to the emir, Baghdadi’s expansion of his criminal enterprise gave al-Qaeda’s command justification to consider him persona non grata. The split in al-Qaeda has given Baghdadi the freedom to pursue his own agenda in Iraq and Syria, to the extent that his organisation has broken away and operates as a separate entity. 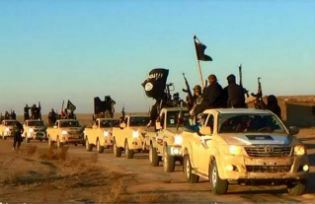 Nonetheless, as the British journalist Jason Burke has observed, he must “confront some of the most acute strategic questions facing Islamic militants over the last decades: whether or not to seize and hold territory, and how to deal with the people living there”. Militants linked to al-Qaeda have seized and held ground before—in Zingibar in south-eastern Yemen, in Timbuktu in Mali and in Mogadishu in Somalia—but each time they have been eventually dislodged by western-backed security forces. There is nothing to suggest that ISIS will be any more successful. But it might simply adapt its guerrilla-style operations by returning to the indiscriminate, expeditionary attacks seen in New York, Madrid, Damascus and Kenya. It would be convenient to blame a US administration which has made withdrawal from the battlefields created by the former president, George W Bush, its policy focus. But this presupposes that the US has the power to stem the conflagration. Yet, as evidenced by Syria and Ukraine, it is neither in a position to dictate to other states how they should behave nor is it able to secure a consensus at the UN Security Council behind its diplomatic agenda. Members of Congress have criticised the administration for providing military aid to Iraq at a time of sectarian polarisation. Some politicians have interpreted events as if they were a manifestation of minor ethno-religious tensions between rival groups, rather than reflecting the inability of the Iraqi government to manage a complex set of circumstances: to represent a diverse citizenry, tackle the root causes of disaffection which propel people into the arms of violent non-state groups and, crucially, exercise its political will in a fair and equitable way. The debate over providing military aid in the context of a resurgence of Islamist violence demonstrates the security dilemma facing western states since “9/11”. The US, particularly, has committed itself to a trade-off: incurring risk by withdrawing troops from the region while stepping up its technologically-driven attempts to contain the problem “over there”. It is time the west adopted a more sophisticated understanding of the key drivers of conflict in Iraq and other parts of the middle east. It must move beyond seeing al-Qaeda as akin to a second coming of the Communist International to recognising an ideology able to act as a lightning rod for disaffection and fanaticism. Perhaps if it identified al-Qaeda’s “ideological kinsmen” as separate entities, worthy of distinct strategies, it might see a return on the long-term investment in diplomacy, blood and treasure in the middle east and north Africa. But this would require introducing nuance into the analysis. In the meantime, the Iraqi people need assistance from the international community, deserving of the hand of friendship as they face one of the greatest threats to their security.